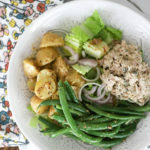 One mustard base used in tuna, haricots vert, and potatoes make a delicious main dish salad. Place the potatoes and garlic cloves in a small pot and cover with water by about 3 inches. Salt the water, and bring to a boil. Boil the potatoes for 10-15 minutes until fork tender. Drain the potatoes. Discard the garlic cloves. In a bowl, toss the hot potatoes with the butter and two tablespoons of the mustard base. Taste, and add salt and pepper until very flavor. In a separate bowl, combine the tuna, capers, dill, and mayonnaise with one tablespoon of the mustard base. Taste for seasoning. Bring two or so inches of salted water to a boil (in the same pot as you used for the potatoes saves a dish!). Boil the green beans for one minute, then drain and transfer to a bowl. Toss the green beans with one tablespoon of the mustard base, one tablespoon of the vinegar, and a few pinches of salt. Whisk the rest of the mustard base with the minced shallot, 1 tablespoon of the vinegar, the honey, and a few pinches of salt. If the dressing seems too thick, add water a teaspoon at a time to thin it out. I start the potatoes to boil FIRST, then work on the tuna and other salad components while the potatoes boil. Then I boil the green beans in the same pot, and can get this salad done in about 45 minutes, sometimes less if I’m super on the ball. It’s worth it!